Arterial embolism is a sudden interruption of blood flow to an organ or body part due to a clot (embolus) that has come from another part of the body. An "embolus" is a blood clot or a piece of plaque that acts like a clot. The word "emboli" means there is more than one clot or piece of plaque. When the clot travels from the site where it formed to another location in the body, it is called an embolism. 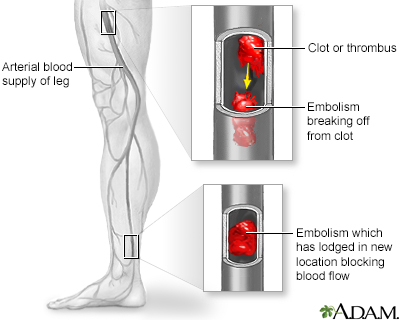 An arterial embolism may be caused by one or more clots. The clots can get stuck in an artery and block blood flow. The blockage starves tissues of blood and oxygen. This can result in damage or tissue death (necrosis). Arterial emboli often occur in the legs and feet. Emboli that occur in the brain cause a stroke. Ones that occur in the heart cause a heart attack. Less common sites include the kidneys, intestines, and eyes. Another condition that poses a high risk for embolization (especially to the brain) is mitral stenosis. Endocarditis (infection of the inside of the heart) can also cause arterial emboli. A common source for an embolus is from areas of hardening (atherosclerosis) in the aorta and other large blood vessels. These clots can break loose and flow down to the legs and feet. Paradoxical embolization can take place when a clot in a vein enters the right side of the heart and passes through a hole into the left side. The clot can then move to an artery and block blood flow to the brain (stroke) or other organs. If a clot travels and lodges in the arteries supplying blood flow to the lungs, it is called a pulmonary embolus. You may not have any symptoms. Symptoms may begin quickly or slowly depending on the size of the embolus and how much it blocks the blood flow. The health care provider may find decreased or no pulse, and decreased or no blood pressure in the arm or leg. There may be signs of tissue death or gangrene. Arterial embolism requires prompt treatment at a hospital. The goals of treatment are to control symptoms and to improve the interrupted blood flow to the affected area of the body. The cause of the clot, if found, should be treated to prevent further problems. How well a person does depends on the location of the clot and how much the clot has blocked blood flow and for how long the blockage has been present. Arterial embolism can be very serious if not treated promptly. The affected area can be permanently damaged. Amputation is needed in up to 1 in 4 cases. Arterial emboli can come back even after successful treatment. Go to the emergency room or call the local emergency number (such as 911) if you have symptoms of arterial embolism. Prevention begins with finding possible sources of a blood clot. Your provider may prescribe blood thinners (such as warfarin or heparin) to prevent clots from forming. Antiplatelet drugs may also be needed. Gerhard-Herman MD, Gornik HL, Barrett C, et al. 2016 AHA/ACC guideline on the management of patients with lower extremity peripheral artery disease: executive summary: a report of the American College of Cardiology/American Heart Association Task Force on Clinical Practice Guidelines. Circulation. 2016;135(12):e686-e725. www.ncbi.nlm.nih.gov/pubmed/27851991. Patel MS, Chaikof EL. Peripheral arterial embolism. In: Cameron P, Jelinek G, Kelly A-M, Brown A, Little M, eds. Textbook of Adult Emergency Medicine. 4th ed. Philadelphia, PA: Elsevier Churchill Livingstone; 2015:1031-1036.